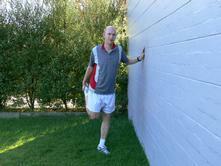 There is quite a bit of debate between runners about running stretches and strengthening exercises. Do you stretch before and / or after your run? Which stretches do you do, if any? Do you stretch before and / or after your run ? Which running stretches are good for you ? Stretching and strengthening before and / or after the run ? As said, there is quite some debate on the issue of stretching and strenghtening. Stretching before you run is of no or little use, but harmless. At least, if you do it well and not with cold muscles. Stretching after you run is a biggie. Always stretch after your run. Light stretching is a good way to cool down after running. And it gives you a chance to strengthen some important running muscles. So, what do I do before my run? Just head out of the door and go for it? Well, when I have an easy run or recovery run planned, then yes. But if I go faster than easy pace, then I certainly warm up first. But not by doing stretching and strengthening exercises. I simply run at easy pace for the first five to ten minutes. After my body has warmed up a bit, I go faster. To be clear, I am not encouraging you to neglect your warming up! Your warming up is important. I am only saying, I don't stretch in my warm up. That's a personal choice which has not done me harm in my running career. However, I always start with at least five minutes, normally about ten to fifteen minutes of easy running (conversational pace). Only after I have sufficiently warmed up I go faster than easy pace. So, if you feel more comfortable with doing a few stretches before you run, please go for it. Just make sure you do them after you have run for at least five minutes. Stretching cold muscles can do some serious damage. Stretching and strengthening after your run is, in my opinion, a must-do. The end of your run should be easy again. Then, do your stretches. This together makes a good transition to the end of your exercise. 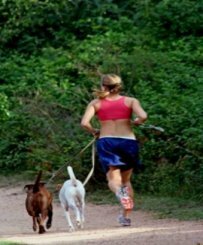 If you stop immediately after faster running, you run the risk that your blood will "stick" in the muscles which you will regret the next day because your muscles will be stiff. Stretching and strengthening is beneficial for another reason as well : your stretching will strengthen some important muscles. This will lead to a reduced risk of injury. So please take note of the the next important stretches. This stretch is so important to prevent achilles tendinitis. Stand on a curb with your front foot. Slowly count to five and lift again. This one is very important for preventing achilles tendinitis as well. And for preventing and/or battling shin splints. Stand on the floor and lift your heels. Slowly count to five and drop again. Whatever you do, wherever you are, do me a favour and always do at least your heel drops and calf raises. Your lower legs will thank you for it! Put one leg forward and one straight leg backward. Put one bend leg out and one straight leg out the other way. Good one for stretching pretty much every muscle in your legs. Put your legs against eachother or only slightly apart, keep them straight and try to touch your toes with your hands. A variation to this one is toe reaching with crossed legs. A good one for stretching the quadriceps. For most people it is a bit hard to keep balance, so you might want to hold on to a pole or a street light or something. 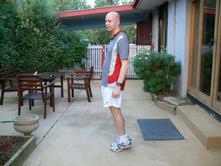 Stand straight on one foot, bend the other leg backwards with the foot against your backside. These are the stretches that I do. There are numerous more stretches you can do and many variations to them. But these stretches together form quite a complete package which will serve you well. 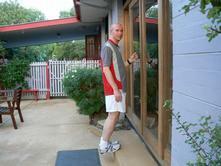 They help you cool down and help you in trying to prevent some major running injuries. Really hope you incorporate these into your cooling-down! Running stretches are good after every run, but especially after more intense runs like intervals it is very important to do these. 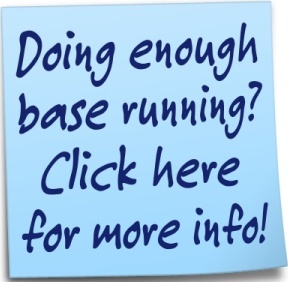 Also make sure you check out all the other running tips available in the running training section.